Hi,I saw your videos on You tube and was impressed. I have a garden office, just installed bu it only has a temporary tyvec cover on at the moment (the company only did felt roofs and we asked for a shallower pitch to the roof for extra height height). It’s under a tree, the floor space is 15m2 (3.75m x 4m) so the roof is slightly larger due to overhangs. Due to height restrictions, I cant’ do a warm roof, so it will be insulated inside with a boatload of cellotex I have. Do you work in Se London? Is the best form of roofing for this fibreglass (GRP?). Do you have any idea how much it would cost? The access is through the house (it’s a victorian terrace) but it shouldn’t be a problem and the are no parking restrictions and we work form home. Any advice on the insulation and the amount of air gap I need to leave would also be appreciated. GRP flat roofs or Glass Reinforced Plastic flat roofs, have in the past been a good alternative to the older tar based flat roofing materials such as Asphalt and mineral felt. Time has moved on, second generation Liquid roofing systems evolved from older GRP systems, a glass fiber matt impregnated with a resin, the resins had been modified to stay flexible unlike Traditional GRP that’s rigid. Third generation liquid flat roofing systems have no glass fibber matt to reinforce them, new resins bond together giving a tough durable materials that’s stays flexible but also very strong. If you have not already seen the 3M video that promotes there new flat roofing system go and have a look they show there old system at the start with the glass fibers this system was good and flexible the new system douse away with the glass fiber saving the material cost and the time but most of all removing a procedure that if not carried out correctly could over time be the downfall of the system. The new system being easier to install means that there are less procedure to undertake on site, less chance of a mistake being made, less chance of a failure in years to come. 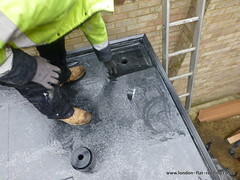 EPDM rubber will be cheaper still very good around £1000.00+vat black and not as good looking. Estimate for new EPDM roof or 3M Scotchkote Urethane Roof Coating SD650 liquid roof. Information from customer regarding his leaking flat felt roof. 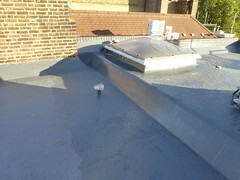 We have a leak on a felt flat roof extension in London NW6 4SS, which is about 10 square meter. We are looking to replace with EPDM. Could you please come around for a quote? Reply By email from London Flat Roofing. EPDM over felt is not recommended as its black and attracts the heat in the summer melting the felt and making the rooms under the roof uncomfortable. To stop this happening the roof will need a OSB Board overlay before the EPDM then flashing’s so I would suggest a price of £1400.00 +flashing’s and scaffolding if needed. Both prices will be subject to how clean the old roof is and its accessibility. If you also send me the address I can look this up on Google earth. These may be of intrest to you. Liquid rubber flat roofing Sd650 by 3M, a set on Flickr. The words Liquid Rubber are what most people perceive liquid roofing products to be, realistically out of the 15 or so liquid roofing materials on the market there is only one Liquid Rubber liquid roofing material that I know is actually liquid EPDM rubber, all the rest are liquid emulsion liquid polymers, or some other kind of material. We are using 3M Scotchkote Urethane Roof Coating. SD650 is a two component, elastomeric, solvent-based urethane for flat roofs and its good, very good! Exactly what you would expect from 3M. It comes with a 25 year guarantee from 3M, when installed by a trained contractor, and yes, we are trained contractors. So if you need any info on the system please don’t hesitate to contact me: Steven Dickinson 07802 300 099 at London Flat Roofing Ltd. This is a link to some of the videos on Youtube we have, showing this flat roofing system. 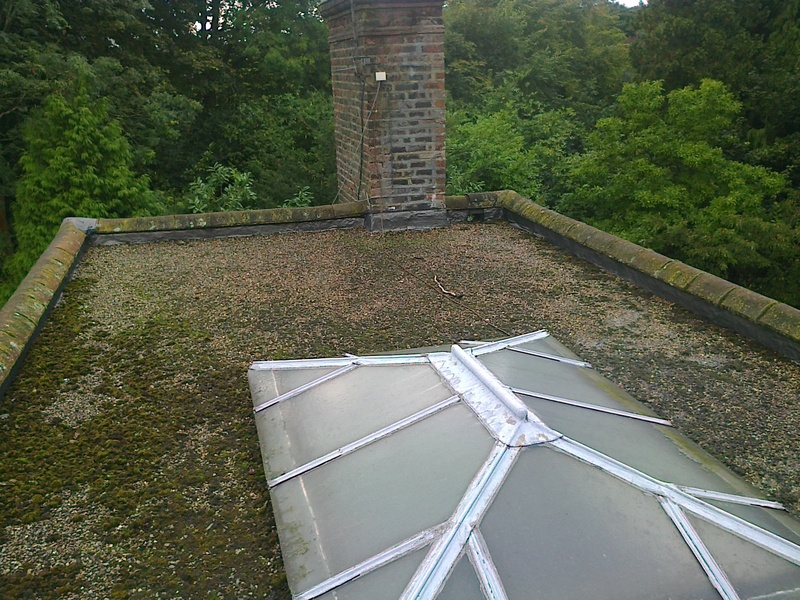 I’ve looked at the photos of the flat roofs you sent me. 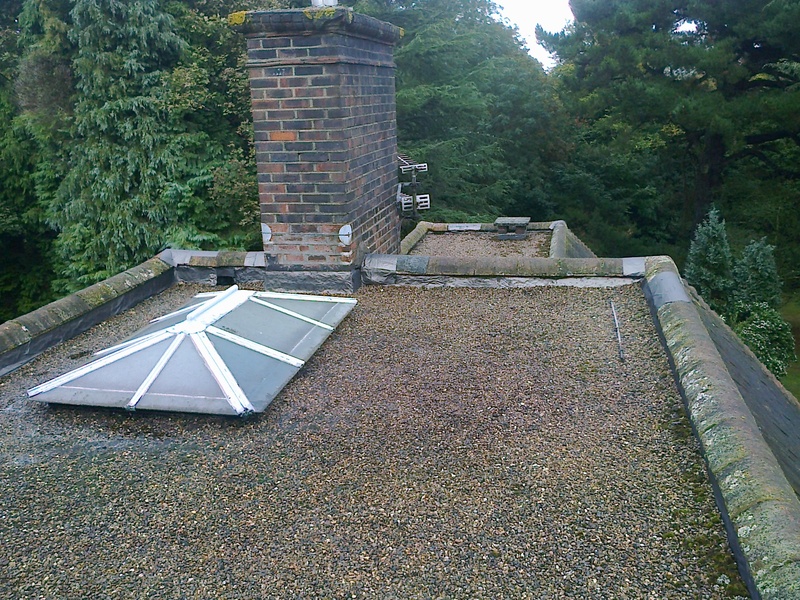 Both flat roofs will have to have hand rails around them before any work can be carried out. Realistically a working platform would be the best option, around 500mm down from the ridge, as the ridge tiles will have to be removed so that the flat roofing material can be dressed up and over the top of the ridge. Both flat roofs will need to be cleaned then overlaid with OSB board before the new flat roofing EPDM Rubber can be installed. An alternative material that could be used is the 3M Scotchkote Urethane Roof Coating SD650. This is a two component, elastomeric, solvent-based urethane for flat roofs and is very light in colour so it reflects the heat of the day in the summer. If you are not going to insulate the roof then this is the best option. It goes directly over the old asphalt, with no need to lay the OSB, so the saving there covers the cost of the slightly more expensive system.